Lake Chapala was the our first stop of our three weeks in Mexico in September. My dad and his husband retired here in 2014. Neither of them had lived anywhere but Southern California before, but they took the leap after one visit. As I write this in late December, I’m back at Lake Chapala. Peter, my dad’s husband, died suddenly on December 19. I’m helping my dad figure out what’s next. In the meantime, we’ll be eating out a lot. Lake Chapala is a mecca for retirees from the U.S. and Canada. I read that during the season (winter up north) as many as 40,000 ex-pats live in the Lake Chapala area. That’s huge. Lake Chapala also draws weekend visitors from Guadalajara, about an hour’s drive. My dad lives in Ajijic, which is a little town full of restaurants and shops. The town square is packed with ex-pats who fill the coffee shops and outdoor eateries. My dad loves to hang out in the square and watch the world pass by. He also loves to eat in restaurants. Since he has no understanding of the vegan lifestyle or plant-based diets, our restaurant excursions are, well, hit and miss. Vegan isn’t really a thing here…yet. There is one vegan highlight here: the plant-based cooking classes hosted by Greg and Eduardo. The size of the class is limited, and I’m so glad I was able to attend. The food and company were outstanding. They’re also offering small vegan feasts each month, and they sell yummy prepared foods at the Ajijic Tuesday farmer’s market and San Antonio Monday market. Check out the Lake Chapala Plant Based Cooking Classes group on Facebook for more information. Here’s my list of the restaurants we visited, in order from my favorite to least favorite. We really tried to look for places that would have vegan options. On our first trip we had only one spectacular failure. On Christmas Day we had a similar failure. These are short summaries. You can see my full reviews on TripAdvisor. This is my absolute favorite place in the area. The margaritas are excellent, as is the roasted tomato salsa they make table-side. My veggie burrito was one of the best ever, filled with perfectly roasted veggies. On the second trip, I made sure we brought my brother here. He’s not vegetarian, and his complaint about most of the restaurant meals in the area was their blandness. Not here–everything we had was excellent and flavorful. Add to that the garden setting and interesting artwork, and you have a completely winning combination. Well, my third visit here wasn’t quite as good. It was on a weekday, and the garden seating wasn’t open. The burrito wasn’t quite as good either. But the margaritas were still amazing. I didn’t go here on my first visit to the area because they were located on the third floor and my dad has difficulty with stairs. They recently moved, and are now on the first floor: a lovely, homey place. I called first to check on vegan options, and Pedro–the owner and head chef–told me they had many. Woo hoo! We loved everything about our meal. The roasted red pepper bruschetta was heavenly, and my pasta with vegetables were perfectly cooked. The price is very reasonable for the quality of the food and overall experience. The menu is small, but Chopsticks has more vegan options than most restaurants in the area. It took me a long time to finally make it here because they’re only open for lunch, and not open on weekends. The feel is a bit industrial, but the fresh rolls and the rice noodle bowl were both delicious and satisfying. Check their Facebook page, as they sometimes close for family events. This restaurant in San Juan Cosalá is perched on a hillside with beautiful views of Lake Chapala. On both visits–one when it was crowded and the other when it was nearly empty–the service was very attentive. Though there are no vegan options on the menu, our server offered several choices, and those we chose were excellent. It’s expensive by local standards, but our dining experience was well worth the price. The building is lovely and the mission of the restaurant–giving back to the community–is admirable. There’s nothing vegan on the menu, but our server said “tell me what you want and we’ll make it.” They had a Kung Pao vegetables (with chicken) on the Specials menu, and I asked whether they could make it vegan. “Of course” was the answer. The veggies came with a wonderful salad. I asked about rice, and they told me it was made with butter. These guys get extra points for understanding and telling me the truth. Everything was excellent. Highly recommended. I love the vibe of this place: you walk in and get hugs from the staff. They understood vegan right away, and made us vegetable fajitas. The food was good but could be better. The owners, never having heard us, took a chance on having us perform there one night. Unfortunately, there was no PA and the sound of the rain overpowered us. Still, diners enjoyed our show. We liked being here, and recommend it. About 1 1/2 blocks from the Ajijic plaza on Hidalgo. They’ll make any of their Wok dishes vegan. I had the Pad Thai, which was absolutely delicious. It’s pricey by local standards, but we left with full bellies and big smiles. I’ll be back to try other dishes. 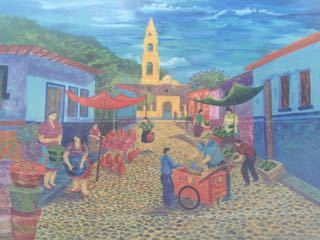 In central Ajijic. One of the few restaurants in the area where I said “vegan” and they understood. The portions were smaller than I would like, but everything was delicious. It’s a trendy kind of place, and a bit pricey, but worth visiting. I didn’t really expect to like this place. It gets great reviews, and it quite meat-centric. However, our server easily pointed out vegan options, and we made a meal from some of the most flavorful side dishes I experienced in the area. Recommended. Of all the places we ate in the area, they win the award for nice people who really try to serve their customers. I loved chatting with the owners, and they made a point of showing me vegan choices. The meals were on the small side, but other than that, I’d go back. I did not have high hopes for this place based on the menu: the only vegetable listed was fried zucchini. However, they made me a vegan bean and guacamole burrito that was quite good. It’s a bit noisy with the traffic of the carretera right outside, but the kitty sleeping under the Christmas tree balanced the noise. The margaritas were great. Most Chinese restaurants have at least a few vegan options: Min Wah has three (though make sure you request no oyster sauce). The spicy broccoli had just the right amount of heat and nice fresh ginger flavors, but the broccoli itself was a bit chewy. This is average Chinese food. Located in just past Ajijic in San Juan Cosalá, this restaurant is huge…and with almost nobody there, the service was excellent. Their vegan options were limited, but they made rice with steamed vegetables and some good sweet potato fries. Drinks were good. I’d come back if nobody could agree on a place to eat. Not vegan-friendly, but I didn’t go here for the food. The guacamole was okay, but mostly I enjoyed their fruit waters. The draw here is being on the plaza and watching the world go by. If you want a real vegan meal, plan to eat elsewhere. Oh, how I wanted to like this place. The outdoor dining is pretty, next to the pool. My dad brought us here on our first day in Ajijic. But…the only vegan option was the salad bar. I hate that. And a mediocre salad bar at that. Come here for a a drink. Enjoy the ambiance. And eat someplace else. We walked by here on the way from my dad’s house to town. We love bagels, yet these were no different from what we get in Guatemala: bread in the shape of a bagel. No vegan toppings, so take them home and have bagel-shaped bread with your own toppings. Meh. Well, it gets points for whimsy. The entrance is filled with animal statues following the whole Ark theme; it’s the best thing about this restaurant. The setting is pretty, with a deck on the shore of Lake Chapala. They made something vegan–rice and vegetables that had no flavor. Even smothered in salsa picante, these vegetables had nothing to offer. The prices were high, and the drinks mediocre. There are better places to get a lake view. Not recommended. Did I mention that we had only one spectacular restaurant failure on our first trip here? This was it. It was hard to write a negative review (though I did). Why? The owner tried hard to make up for the fact that my vegetarian plate was served with meat on it. My dad loves this place and was excited to bring us here. They said they would make a special vegan plate for me. And then they served me meat–it was the first time I’d ever had that happen! The owner was apologetic, but it really was an unpleasant experience. Oh, and the music was live but not very good. I wouldn’t go back. I arrived in Ajijic on Christmas morning after an early flight from Guatemala City. I hadn’t eaten, nor had my dad or brother. We started calling restaurants, only to find that most of the places my dad usually goes were closed. Los Telares had mixed reviews, but the distinct advantage of being open. The waiter clearly knew the vegan options and told me they could make a vegan pasta dish. Yay! However, when the dish came out, it was served with cheese and bacon. I sent it back–twice. What they finally served was one of the worst pasta dishes I’ve ever had–hungry as I was, I couldn’t even eat it. They didn’t charge me for the pasta, but that was the least they could have done. You’d have to drag me back here kicking and screaming. May I add a place to your list? As a mostly raw, whole food plant based eater, I have even fewer options than regular vegans. However, Frida’s across the street from Superlake is my absolutely favorite restaurant. Why? Because the food is as good as my own at home, it is not salty and oily. And you can’t bit the prices. The only drawback: they close at 5PM most days of a week but are now open til 10 on Fridays and Saturdays. Thanks so much for your addition, Emma. I look forward to trying it the next time I’m there. 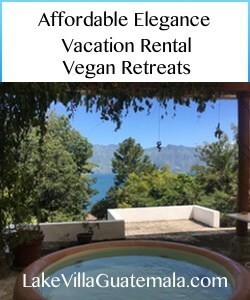 Being familiar with both Atitlan and Ajijic I really enjoyed reading your take on these places. We’re retiring to Ajijic later this year, and it will be only our second visit since becoming vegan. Very helpful to read your reviews here, and to discover the cooking class! Gracias! Thanks, Glenn! I’m glad that others can benefit from my experience. FYI, I tried Don Quijote on a later trip and the vegan paella was great. Also, Just Chillin’ closed down their Ajijic location. Thank you for posting this. Eating vegan in Lake Chapala is challenging. We have been to most of these restaurants, but it was nice to hear your take on them. I will add a few comments. We went to Roberto’s and as you said there was nothing on the menu. I asked if they could make us something vegan and the waiter said yes. I didn’t know what they were making, but he brought us a pasta and vegetable dish that was really quite tasty. I was surprised since I don’t like this restaurant and only went because some friends wanted to. Here are some other places you might try if you return: Lake Taco has a very nice large vegeta and will leave out the meat for you and add tofu if they happen to have any. I try to call a day ahead so they have tofu. The chinese place in the centro Laguna food court will cook up a stirfry of just veggies that are quite tasty and inexpensive (ask them to go easy on the oil) and they will give you white rice if you want. Don Quijote does a very nice veggie paella. I would also recommend your checking out Yelp to find restaurants in the bigger cities. I use it in Guadalajara. Thank you for your comments, Anita! I’ll check the places you mentioned–veggie paella sounds great!